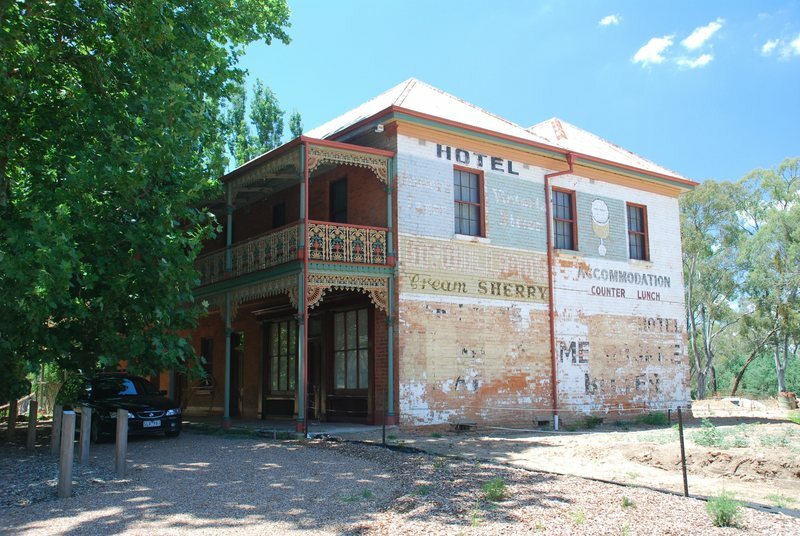 The Gregory's Bridge Hotel, situated on the banks of the Goulburn River was built between 1865 and 1868 and was known until the 1890s as Thorne's Bridge Hotel and Store. It is a substantial country hotel which also comprises a large general store and cellar as part of the building, stables at the rear and the remnants of a once magnificent garden. In front of the Hotel on the road reserve is a large and outstanding London Plane (Platanus x acerifolia) which was planted in 1916.The tree dominates the north side of the Hotel, and mostly blocks out the facade of the building. The tree has outstanding form, size and branch structure, and is one of the finest and largest London Plane trees in Victoria. 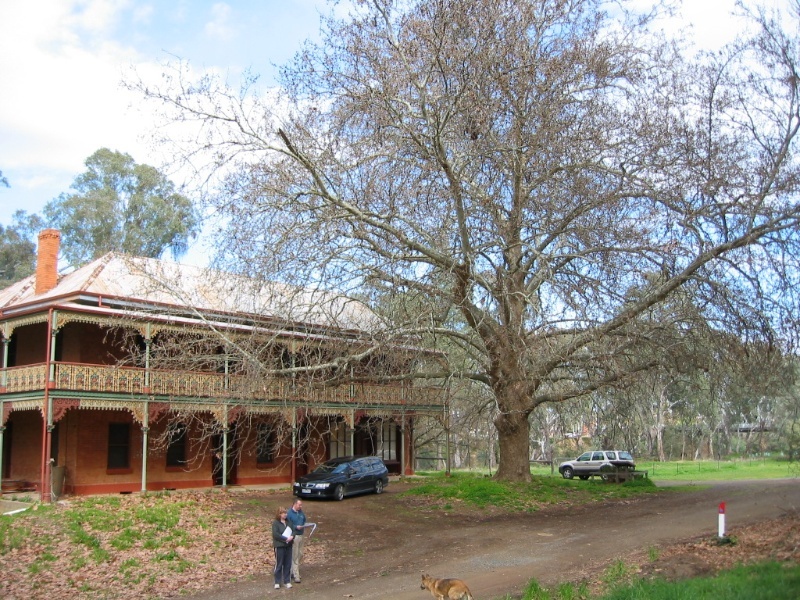 The only larger trees known in Victoria occur at The Melbourne Club, Harrietville, and Kyabram. Once known as the "Mecca of the Valley" because of its four acres of magnificent gardens and riverside setting, the former Gregory's Bridge Hotel was extensively patronised by tourists, commercial travellers and local inhabitants. Thorne was succeeded as licensee by Mr E. J. Gregory who added a second storey to the rear of the building in 1905 and renamed the hotel Gregory's Bridge Hotel. The hotel was said in 1909 to be 'easily the best known hotel in the Goulburn Valley' and was patronised by commercial travellers and tourists as well as locals. It is a historic symbol of the importance of hotels in a late nineteenth century community. The former Gregory's Bridge Hotel is a substantial reminder of the importance and influence of commercial travellers and the Commercial Travellers Association in Victorian society. Gregory's Bridge Hotel Murchison is of architectural, aesthetic and historical significance to the State of Victoria. Gregory's Bridge Hotel Murchison is of architectural significance as a representative example of a substantial two-storeyed brick country hotel with stables of the 1860s with cast iron decorative panels to the return verandah. The London Plane tree (Platanus x acerifolia), planted in 1916, is of aesthetic (landscape) significance, providing an attractive landscape setting for the historic Gregory's Bridge Hotel. The tree has outstanding form, size and branch structure, and is one of the finest and largest London Plane trees in Victoria. Gregory's Bridge Hotel Murchison is of historical significance as an example of a substantial country hotel, stables and general store built in the 1860s catering to commercial travellers and tourists. Gregorys Bridge Hotel, 10 High Road, Murchison, Greater Shepparton Shire Council. 1. All the buildings known as the former Gregory's Bridge Hotel, being the hotel building B1 and the stables B2 as shown on Diagram 963 held by the Executive Director. 2. The London Plane tree shown as T1 on Diagram 963 held by the Executive Director. 2. 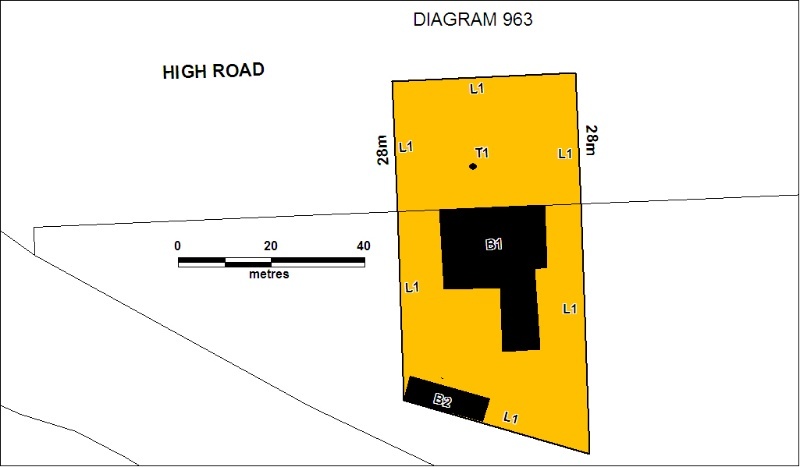 All the land in Crown Allotment 1 described in Certificate of Title Volume 6442, Folio 205 and part of the Road Reserve of the Murchison-Violet Town Road and marked L1 on Diagram 963 held by the Executive Director. All internal painting works of previously painted surfaces.Preparation work for painting shall not remove evidence of the building's original paint schemes. * Repairs, conservation, and maintenance to hard landscape elements, buildings and structures, fountains and monuments, steps, paths, paths and gutters, drainage and irrigation systems, edging, fences and gates. specimen trees, avenues, rows, shrubberies flower beds, and lawns. * In the event of loss of any tree or palm specified in the Extent of Registration, replanting with the same species of tree as that removed. * Management of trees in accordance with Australian Standard; Pruning of Amenity Trees AS 4373. * Vegetation protection and management of the possum and rabbit population. * repairs, conservation and maintenance to plaques, memorials, roads and paths, fences and gates and drainage and irrigation. * The replacement of existing services such as cabling, plumbing, wiring and fire services that uses existing routes, conduits or voids, and does not involve damage to or the removal of significant fabric. strategies. The importance of places listed in the Heritage Register must be considered when strategies for fire suppression and management are being developed. * Development including emergency stabilisation necessary to secure safety where a site feature has been irreparably damaged or destabilised and represents a safety risk to its users or the public. Note: Any Minor Works that in the opinion of the Executive Director will not adversely affect the heritage significance of the place may be exempt from the permit requirements of the Heritage Act. A person proposing to undertake minor works may submit a proposal to the Executive Director. If the Executive Director is satisfied that the proposed works will not adversely affect the heritage values of the site, the applicant may be exempted from the requirement to obtain a heritage permit. If an applicant is uncertain whether a heritage permit is required, it is recommended that the permits co-ordinator be contacted. The cultural heritage significance of the place is primarily due to the architectural qualities of the original buildings and the historical associations of the site and its significant London plane tree, The hotel, surviving stables and tree are essential elements that demonstrate the significance of the place. The existing site boundaries should be retained in their entirety. Any work to the hotel and stables is subject to permit applications. All works to non-registered buildings, including demolition and internal modification but excluding exterior additions, are permit exempt. The purpose of the permit exemptions is to allow works that do not affect the cultural heritage significance of the place. Alterations that impact on the significance of the place are subject to permit applications. Permits would be required for any new buildings, structures, landscape works, driveways and paths on the registered land.